Global Cult Comic House Modern Toss Give Grassroots Football Club a Boost to Promote Next Home Game. The Hawks‘ received a welcome boost to their current relegation dogfight this week with the launch of a matchday poster for the next home game designed by global Cult Comic House Modern Toss. 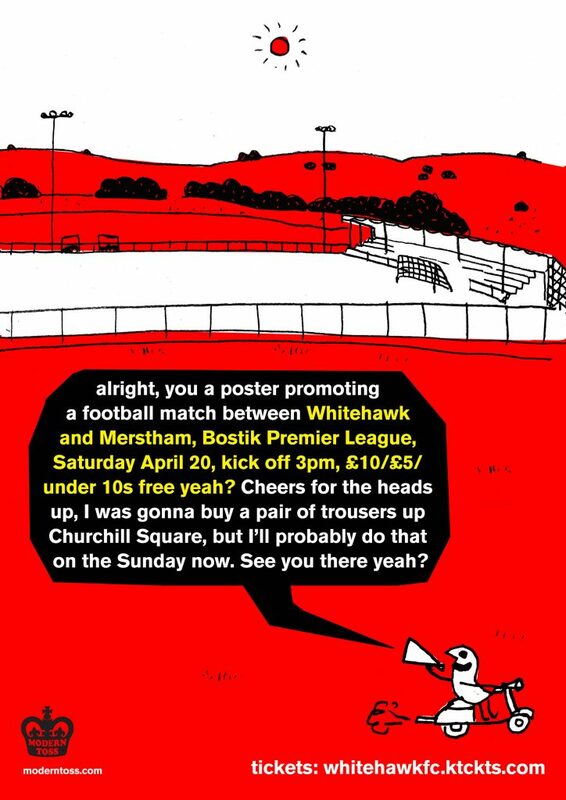 The poster promotes the Hawks next home game against Merstham on Saturday April 20, and features one of the Brighton-based comic’s characters, ‘Drive By Abuser’. The club hope to sell as many as possible and raise much needed revenue for the final few games of the 2018/19 season. The Hawks currently lie in 21st position, three points from safety, with four matches remaining. To purchase the poster visit whitehawkfc.ktckts.com and click on ‘poster’.